The iconic West End venue is set for an especially glamourous year. This glamorous Theatreland institution has been running longer than any show — even The Mousetrap. So perhaps it’s not surprising that The Ivy’s 100th birthday celebrations are going to last a whole year — with its bosses promising a packed schedule fit to mark a venue that has hosted the biggest stars of stage and screen. 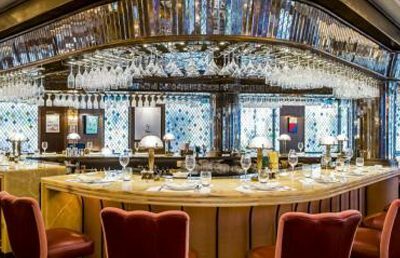 British greats such as Noël Coward, Laurence Olivier and Vivien Leigh all dined at the discreet venue tucked away off Charing Cross Road. Tom Cruise and Angelina Jolie are among the venue’s American fans, and recent diners have included Benedict Cumberbatch and wife Sophie Hunter, Tom Hiddleston, and Gemma Arterton. Today a plaque was unveiled outside the venue in front of a clutch of actors including Miranda Richardson, Jack Fox and Samantha Barks, as well as Westminster council’s deputy leader Robert Davis. Records do not reveal the exact date Abele Giandolini opened his Italian cafe in West Street, so The Ivy’s current owner Richard Caring, and management led by director and ex-maitre d’ Fernando Peire, have turned the whole of 2017 into a rolling birthday party. Mr Peire said: “We want to be doing things all year, to do one thing on one night means excluding a lot of people.” Detailed plans are still being drawn up but include a new £19.17 pre-and post-theatre menu in spring; a new cocktail menu; a special Ivy Gin; a recipe book; anecdotes and history celebrating the first century written by Mr Peire; theatrical events in the autumn; and a celebratory Christmas installation. The book by Mr Peire, who joined in 1990, will reveal the highs and lows of a restaurant riven by the split between Giandellini and his first maitre d’ Mario Gallati, who left to set up arch-rival Le Caprice in the Forties. After the war — legend has it that The Ivy stayed open every night of the Blitz — it lost some of its allure and by the late Eighties had been eclipsed by new destinations such as The River Cafe. But after Chris Corbin and Jeremy King took it over, it was relaunched in 1990 and quickly attracted stars of Hollywood, TV, sport and music. Mr Peire says he recalls a week in the Nineties when Wimbledon coincided with a film festival and it was normal to see Jack Nicholson and Harrison Ford sitting under the famous diamond leaded windows. Diners one evening included Meryl Streep, Andre Agassi, Danny DeVito and Whoopi Goldberg. “That night I really had to pinch myself,” he said.